Updated March, 2018: With the coming of March we will soon be up at the 30th Annual Spring Daytona Turkey Run on March 22nd-24th. Held inside the world famous Daytona Internationals Speedway, this is the second biggest event in Florida......with only the Fall Daytona Turkey Run held over Thanksgiving weekend each year being bigger. We will once again have our booth at the end of the food row, near the entrance to the swap meet, and look forward to seeing everyone. If you would like more info about the Spring Daytona Turkey Run visit their website here. Also, just around the corner is another great show, the 32nd Annual Southeast Street Rod Nationals on April 5th-7th. Hosted by the NSRA (National Street Rod Association) at the Florida State Fairgrounds in Tampa, it is open to vehicles 30 years and older. This is among our favorite shows each year, and we will once again have a table set up in the indoor vendor building.....plus of course taking part in all of the fun outside. We hope to see everyone there as well. For more info on the Southeast Street Rod Nationals visit their website here. 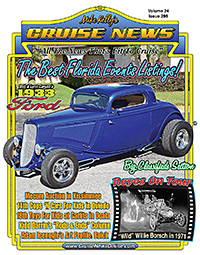 If you'd like to know where all the shows and cruise-ins will be during March simply pick up a copy of our printed magazine and flip through the 37 pages of Coming Attractions - listing upcoming events for the next 6 months. Plus there are 17 pages of Weekly & Monthly Cruises letting you know of places to get your fix during the week. 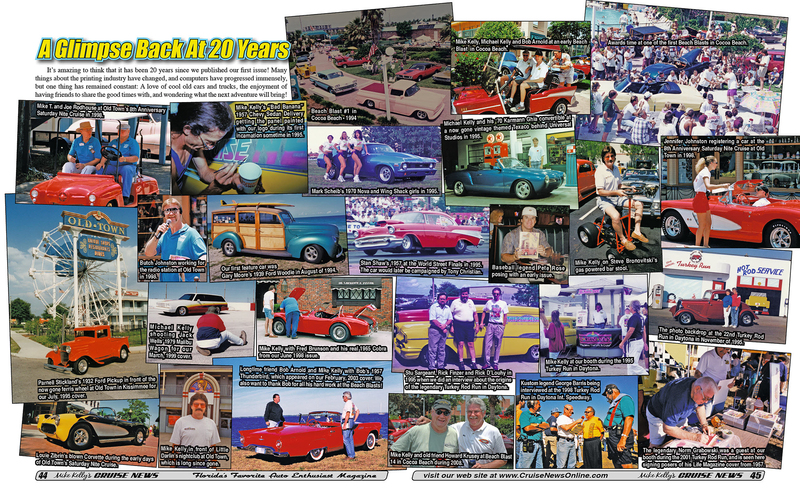 We hope to see all of you in the upcoming months while we're out and about at the various cars shows and cruise-ins. Until then, keep the wheels spinning' and the face grinnin'. The ever popular Classified section was updated with lots of new additions. The Feature Cars section now includes the 1933 Ford Hiboy Coupe belonging to Bob and Lynn Caruso. Plus the printed magazine also includes Kidd Darrin's "Rods & Ends" column about Junk Yards. The Reyes On Tour photo spotlight features "Wild" Willie Borsch in 1971. Adam Icenogle's illustrated column is about David Dunbar Buick, and as always we have the best Florida upcoming events listings other interesting items. The contents of this site, including all text and images, are copyright © 2002 - 2019 Mike Kelly's Cruise News. All rights reserved.